Today, I finally lost my virginity. My Star Trek virginity, that is. (Side note: I bet this is not the first time the words "Star Trek" and "virginity" have been linked, but it may be the first time that the word "lost" has been included the mix). Up until today, I had not seen a single Star Trek episode from any of the television versions: not the Original Series, not Next Generation, not Deep Space Nine, not Voyager, not even Enterprise (though I have heard the opening theme song to it--big Russell Watson fan). It isn't as if I was completely unaware of the Star Trek universe: I have seen the films from Star Trek: The Motion Picture up to Star Trek: Generations as well as the 2009 Star Trek. I know of certain elements of the mythos: I've heard of such things as the Ferengi and Klingons (though to this day I still don't understand what exactly Q is). I've seen clips from the various incarnations (and would always stop if I caught a sight of Counselor Troi) yet an actual episode any television version from start to finish I had always missed. There are some less charitable of my Trekkie/Trekker friends who say the reason I've never seen any Star Trek is so that I can brag about never having seen any Star Trek. This makes me look far too duplicitous...and slightly deranged. I take pride in the things I have done, not the things I haven't. Frankly, I just wasn't all that interested in Star Trek. I had my science-fiction television quota with Doctor Who, so why would I go anywhere else? Still, I have been pressured intensely to watch Star Trek. With great reluctance, I did so. Now, what episode would I lose my virginity to? Would it be Plato's Stepchildren, which featured the first interracial kiss on American television (though the clip I've seen makes it look like Kirk and Uhura's lips never actually touched)? Would it be Space Seed, where Ricardo Montalban's master villain Khan first appeared? What about the comedic The Trouble With Tribbles? We begin on board the U.S.S. Enterprise, when a beautiful woman appears on deck. This mysterious creature then knocks the crew unconscious. She then wanders over to Mr. Spock (Leonard Nimoy). The next thing we know, Spock is no longer on the bridge. Instead, he's been found in Sick Bay, where Dr. Leonard "Bones" McCoy (DeForest Kelley) informs Captain James T. Kirk (William Shatner) shocking news: Spock's brain is gone! It has been removed from his head, and without it, he has only twenty-four hours to live. They track down his brain due to an ion trail to a seemingly empty planet. There, they discover it is not uninhabited. Instead, it is populated by fierce cavemen-like men and a bevvy of beautiful women beneath the surface. Taking the zombie Spock with them to Sigma Draconis VI, this coven of beauties cannot understand what the Enterprise crew is talking about, but they eventually make the connection between what they are looking for and what they call The Controller. The Enterprise crew discover Spock's brain within the machinery of The Controller, but now with time running out it's up to Bones to quickly learn how A.) the removal of Spock's brain was done, and B.) the return of said brain to its original body. Already from the get-go to Spock's Brain, this rather mundane question has to be asked: how exactly does someone go about removing a brain without causing someone's death? This thing about having twenty-four hours to find a brain just strikes me as silly--Vulcan or not. If I'm suppose to believe all this, a little machine not only can make Spock move about, but also keep his vital signs going and his body functioning. Yes, Trekkies, I know: Vulcans have a special ability to stay alive, but even that can't explain how Spock can guide Bones in restoring Spock's own brain. 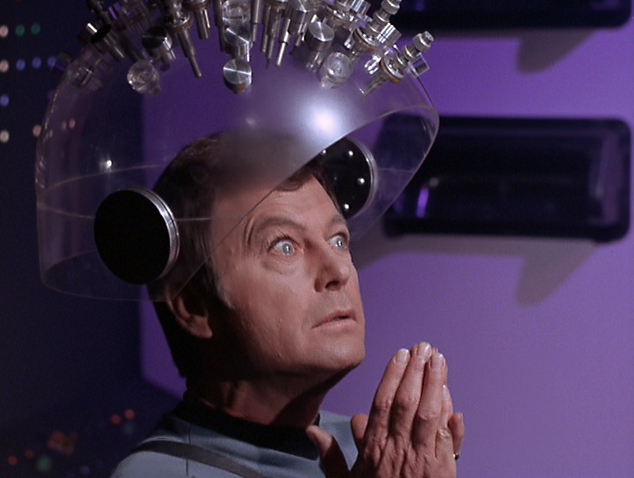 I wonder, since Spock can't see where McCoy is operating, how can he direct the doctor to connect the brain? We have to take into consideration that, given their ability to live a day without a brain (that sounds like a good title, doesn't it) Vulcan physiology must be different from humanoid physiology. 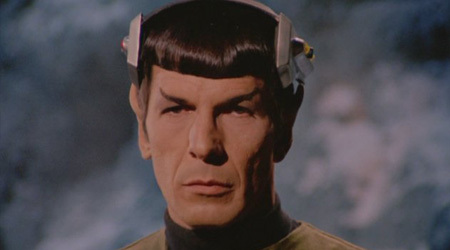 Does it matter that Spock is half-human, or is it worth even mentioning that here? Let us leave thoughts of trying to make sense of the plot for now. Let's go on to the performances. I don't think I've seen an actor wildly overact as much as Kelley, as if by being so over-the-top he could convince us that the story made sense. It's clear from his performance that Kelley was not taking any of this seriously, which spells disaster for the story. Any good actor should perform a script as if it were real, and when he/she does even the silliest premise will be believed by an audience. If he/she doesn't believe in the material, then we the audience won't either. For example, look at some of Joan Crawford's later films (Strait-Jacket, Berserk!, Trog). None of these are great films, but she gave strong performances in them because she took the script seriously (even though she probably knew the stories were a little outlandish--Trog completely outlandish and flat-out as idiotic as is Spock's Brain). "Who...who controls? I would like to see...to meet him". "From the very...first...I appreciated your ability". "You must restore...with that knowledge...what you have taken". "You must...move to the surface". It was becoming more and more absurd, and while Spock's Brain itself was absurd as a story, Kirk's predilection for stopping mid-sentence only added to the silliness of it all. Yes, Nimoy saved himself by basically being a zombie through most of the episode, but his presence wasn't really needed. Come to think of it, Chekhov (Walter Koenig) wasn't needed either. His presence was rather superfluous in Spock's Brain. Once the crew teleports to S.D.VI he pretty much disappears (and I'm sure Koening isn't upset about that). He doesn't go with them, and for the remainder of the episode he stays outside with two other crewmen, fighting the cold around a fire. That's what happens when a character is in a story where he/she has nothing to do--they just sit around and remind you that there is no direction to the story. "Brain and brain! WHAT IS BRAIN?" I couldn't stop howling with laughter at this. In fact, I rewound that moment at least four or five times, just so that I could relive Dusay's crazy bit of Method Acting. You can guess that I call Spock's Brain the Citizen Kane of Star Trek episodes as a joke, but I'm not joking when I refer to THAT LINE as perhaps the Citizen Kane of Star Trek dialogue. I also question certain points of logic within the story (a remarkable feat indeed). If the women on S.D. VI (Side Note: the show struck me as remarkably sexist in its view of women as extremely simpleminded, almost vapid) were so dumb as to not be able to function without a foreign brain around, how was Kara able to remove Spock's brain with the greatest of ease and leave his body intact? I guess it had something to do with that helmet that stored all the knowledge of the ancestors, but that helmet...Dear God, that helmet! With all those plastic spikes coming out of it, it looked like a hat made for Pinhead from the Hellraiser films. I laughed at that too, as well as when the second operation took place. It was obvious that it was merely a board (which I thought was cardboard) covering the top of Nimoy's head, with a little blue light behind it. For all the criticism Doctor Who has taken for its cheap-looking effects (mostly valid), those on some of the lesser Who stories like Time-Flight or Warriors of the Deep look almost Matrix-worthy compared to Spock's Brain. Another thing I wondered about were the Cavemen, apparently aware of the women below but seemingly clueless as to how they were involved in procreation. They refer to the women as The Others (long before Lost, I'd like to point out, used that term), who gave them "pain and delight". I was thoroughly puzzled by that: pain and delight. If I didn't know any better, I'd say a strong suggestion of S & M permeated the dealings between the Cavemen and the Others. Pain and Delight...any Trekkie want to explain that to me? (Side note: one thing that confused me--out of many--is, with all the beautiful and brainless women running around in skimpy outfits, how is it that Captain Kirk never once tries to get it on with them? Just a thought). The sets were beyond cheap-looking. The court of the women looked like a 60s-era lounge, complete with multi-colored light fixtures. The costumes of the women were similar to figure skaters at the Olympics (one expected to hear 'Welcome to Star Trek On Ice!'). Fred Steiner's score was ridiculously serious for such a ludicrous plot. In short, nothing in Spock's Brain worked (pun intended). Now, let me answer this: why of all the Star Trek episodes in all the versions did I choose this one? Quite simple: I'm fed up with the snobbishness of Trekkies (bet you've never heard 'snobbishness' and 'Trekkies' in the same sentence). As a Doctor Who fan, I've had to suffer the airs and pretensions of Trekkies/Trekkers who have come to believe that Star Trek IS, indeed, the Citizen Kane of science-fiction television programs. I've endured comments about how the Star Trek villains are supposedly better than the Doctor Who villains (how the Klingons are better than the Daleks for example), how the special effects on Star Trek are supposedly better than those on Doctor Who, how the stories on Star Trek are supposedly better than those of Doctor Who. I decided to lose my Star Trek virginity to Spock's Brain to in a sense remind Trekkies that you have your own embarrassments, and that not everything on Star Trek is a masterpiece. I'm the first to say that not every Doctor Who story was great (some were flat-out embarrassing), but for every Time-Flight, there is a City of Death, for every Timelash there is a Caves of Androzani, for every Love and Monsters there is a The Unquiet Dead. In short, there will be in every series brilliant stories (The City on the Edge of Forever) and just really, really horrendous stories (Spock's Brain). One shouldn't throw the baby out with the bathwater, and it's time Trekkies realize that their series A.) isn't perfect, and B.) some stories from other sci-fi shows are actually rather good. There is, however, another less harsh reason I picked on Spock's Brain (no pun intended). This was the opening episode of Season Three, and as such would have been the introduction to anyone who had not seen the first two seasons but had been convinced to watch the series. I think few people, even Trekkies/Trekkers, would not say that the creative team couldn't have picked a worse episode to start a season than this one. If I had been around back then I would have been on the floor laughing myself silly thinking how anyone could think this was good. Again, it was the worst way to begin a new season, and if anyone had had Spock's Brain be their actual introduction to the franchise, they probably would never have taken anything else Star Trek-related seriously. Well, there it is: Spock's Brain is completely witless (pun intended). It crystallized the worse of all Star Trek: The Original Series: cheap sets, bad acting, a nonsensical story. It's part of the myth, and Trekkies/Trekkers can't deny it. However, it's only one episode out of the whole show. I will say that if you really do believe Spock's Brain IS the Citizen Kane of Star Trek episodes, I need to ask you: "Brain and brain. WHERE IS YOUR BRAIN?" *Since watching Spock's Brain, I have seen at least two others: The City on the Edge of Forever and Space Seed, and while I find the sets still on the cheap side (The Guardian of Forever especially silly-looking) the story itself was quite inventive and tragic, investing the characters with real emotions and bringing an emotional reaction to their actions and consequences. The City on the Edge of Forever probably is the real Citizen Kane of Star Trek: The Original Series episodes, or at least among the very best of them. I confess I won't be a Trekkie/Trekker, but at least I won't dismiss the show offhand like I used to; if only Trekkies could extend the same courtesy to Doctor Who.